You may already know that the Cook Islands are a tropical oasis in the South Pacific, a Polynesian archipelago made up of 15 specks in the ocean. But here are nine other things that you may not know about the Cook Islands (and all the reasons why it should be your next holiday destination). It’s no secret that some other holiday destinations have been harshened by the westerner’s touch; their peaceful beaches now flocked with tourists and their lush forests replaced by concrete high rises. But you won’t find that in the Cook Islands — there’s a government mandate that states that no building can be taller than a coconut tree. What’s more, the nation is environmentally conscious, with designated conservation areas, sustainable farming of black pearls and an aim to use 100% renewable energy by 2020, including solar and wind power. 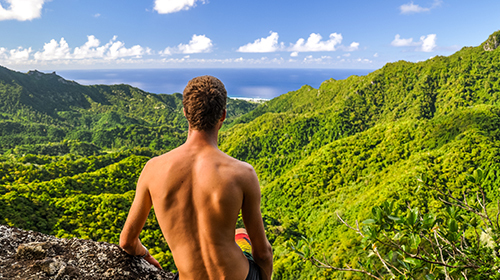 Rarotonga has a circumference of just 32 kilometres, meaning you can walk around the island in half a day. It has an intimate, laid back feel, and nothing is too much of a problem. Wake up in a bungalow and take a dip in the ocean. Enjoy a swim and snorkel in the lagoon, and have lunch at a nearby café. And at night, treat yourself to a 5-star dinner at Nautilus Resort Rarotonga in Muri Beach, and head out to one of the many bars – the island has a buzzing nightlife. Of late, the craft beer movement has been making waves around the world, so it’s little wonder that it’s made its way to Rarotonga, with Matutu Brewery producing the thirst-quenching drink. A visit to the brewery, which is family owned and operated, is well worth your time, and you’ll find the golden liquid in all cafes, bars and restaurants. There are three options – a lager, a pale ale and a new draught. Cooks Lager Brewery and The Tumanu Experience, which are also in Rarotonga, are must-visit experiences as well. Traditionally, bush beer was brewed on the islands from oranges, bananas, paw paws and hops, however, today the practice is only available on the island of Atiu in the Cook Islands. It’s not an exaggeration to say that you may well spend half your time on holiday in the surrounding waters of the islands, either submerged under the surface or cruising above on top by boat or kayak. Rarotonga, the largest and most populous of the islands, is surrounded by a lagoon, fringed with coral reefs with calm waters to snorkel and scuba dive (the majority of the spots are accessible from the beach). On a good day, you can expect visibility of up to 60 metres. Leave the wetsuit at home and enjoy year-long tropical temperatures, with the water ranging from 24 to 28 degrees. 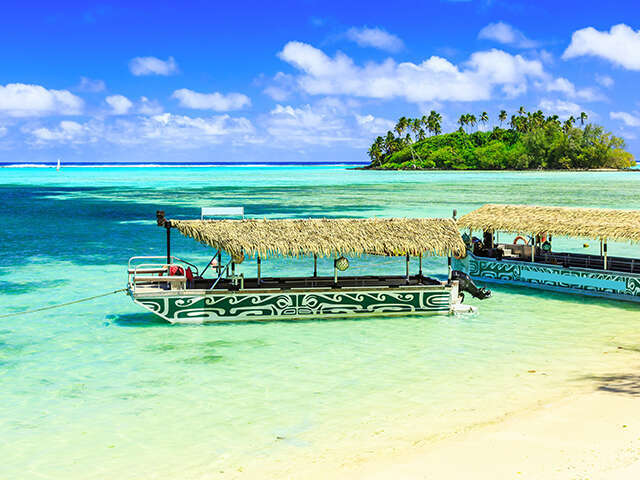 But it’s the vivid blue waters of neighbouring island Aitutaki that really will take your breath away – it’s often dubbed the world’s best lagoon. Just a 45-minute flight from Rarotonga, the second-most visited island is famed for its white sand and waters. One of the best ways to explore Aitutaki’s lagoon is on a day trip on board a traditional vaka, or boat. And for your stay, we recommend the casual luxury of Tamanu Beach Resort Aitutaki. Rarotonga has a local population of just over 15,000 people, and just a handful of cars on the road, so there’s no need for traffic lights – say goodbye to fumes and honking. Exploring the island is safe and relaxing, with most people opting to travel by foot or on one of only two local buses on the island that will pick up anyone at any time – just be sure to give the bus driver a smile. Many holiday goers chose to hire a scooter which is an easy way to explore, too. While the Cook Islands’ main attraction may be the clear waters, the lush jungle provides the perfect playground for an adventure-fuelled holiday. A must-do for the more daring traveller is the four-hour trek Cross-Island Track, which takes you through rugged terrain to reach the Needle, a unique rock formation. It still holds deep spiritual significance for the locals – in 2002 the Dalai Lama declared it one of the world’s eight remaining energy points after journeying there with “Pa”, a well-respected elder. Bike riding is another popular activity. You can join a group for a more challenging experience, or hire a bike nearby and cruise around the streets, riding at a leisurely pace. For something a little bit more adrenalin-pumping, quad bikes and four-wheel drives are popular, with the drivers acting as a local tour guide, too. The Cook Islands are home to a variety of marine life, tropical flowers and plants. However, there’s not a snake or poisonous spider in sight. In fact, there are only six species of birds that are native to the islands, including the rare Kakerori, which can sometimes be spotted on the south coast of Rarotonga in the forest. You might see humpback whales as they migrate through the waters between June and September. While scuba diving, you may swim next to a green, sea or hawksbill turtle, although the latter is now an endangered species. Snorkel with angel fish, butterfly fish and parrot fish. If deep sea fishing interests you, take a day trip out on a boat and try your luck catching marlin, wahu, tuna or mahi mahi. And that’s because you won’t see a fast food chain anywhere on the islands. Instead, try a local snack from a roadside market stall, or dine at one of the 50+ cafes and restaurants in Rarotonga, which range from spots to eat at while barefoot, to places appropriate for a romantic night out. Eating on the islands is like a tropical foodie’s heaven, with just-caught seafood, fresh fruits and vegetables such as taro, kumara, bananas and papaya. A popular drink is coconut water (as well as cocktails). For something a bit more traditional, rori (sea cucumber) is eaten raw or cooked. And raw fish called ika mata is cured with lime, onion and coconut. Unlike some places in the world where the locals like to keep to themselves, the Cook Islanders relish any opportunity to mix with the tourists, to learn about each other’s culture and to genuinely lend a helping hand when needed. On a Saturday morning stroll on down to the vibrant Punanga Nui cultural market, where you’ll find one-off crafts, sarongs (pareu), black pearls and the chatter of locals intertwined with the live, melodic music of the islands. At night, Rarotonga comes alive with cultural shows thrown by the locals – an enticing showcase of the native heritage performed through songs, flames and a bit of hip shaking. On Sundays, travellers are welcome to attend a church service; the majority of locals are Christian and the island is dotted with 24 of the white-brick buildings. Enjoy the exotic flowers and the moving sounds of the beautiful hymns, but be sure to dress respectfully. 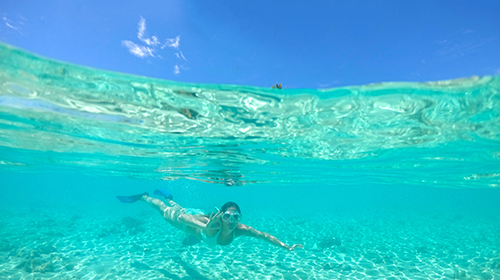 So whether you’re after a romantic getaway with your partner, a place to unwind and relax or somewhere to explore both the land and sea, the Cook Islands offer plenty of choices. The only problem is, you won’t want to leave.